Normally, Friday night is pizza night. But I guess we were all feeling like we needed a change of pace (and maybe some cheering up after a tough week), so we decided to do something new with the kids. Something new involving setting fire to food before their very eyes. We decided to go to Susumu, a venerable teppan-yaki place in Lynnwood off 196th. Before we had kids, this and BeniHana in Seattle were favorites of mine. There is just something so fun about having the food prepared at your table, especially if they set fire to it. Also, you can order drinks in a ceramic geisha. Or sumo wrestler. Who doesn’t want a ceramic geisha? Or sumo wrestler? Okay. I know, it’s cheesy. But I like a good show, what can I say? 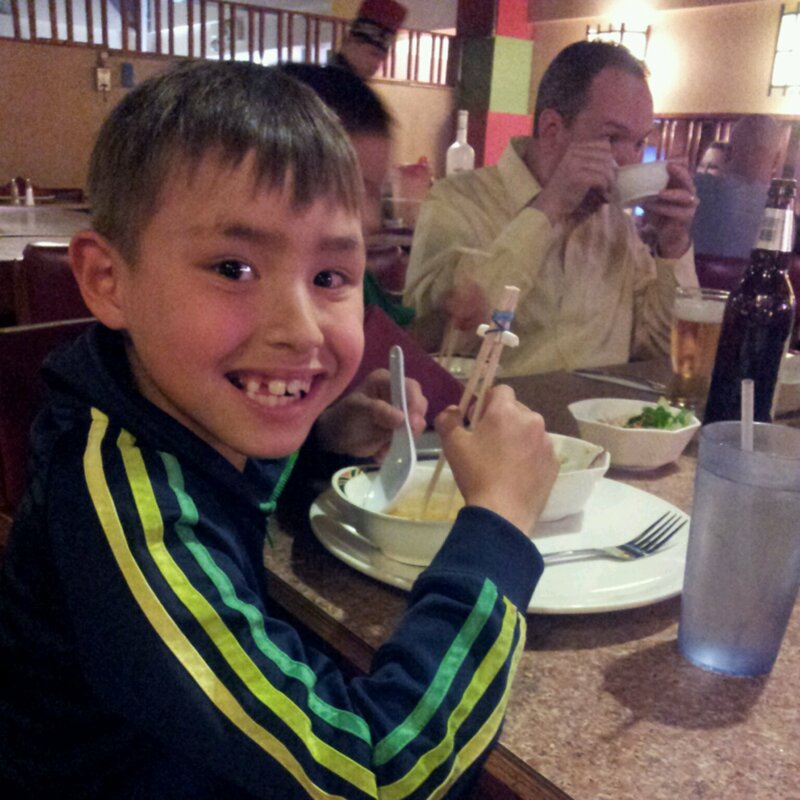 We hadn’t been to Susumu in years, but it was just as we remembered. Same Japanese samurai dolls behind glass, same slightly sketchy entrance, same smell of cooking oil lingering in the air, same waitresses in shortie kimonos. Same vinyl club chairs on rollers gathered in groups of 8 around the cooking grills. As you walk in, you begin to wonder, have I made a mistake in coming here? But as soon as the grill is turned on, and the chef comes out to your table, something magical happens. All Susumu’s faults begin to fade into the background as your senses are overtaken by fire and smoke and the metallic clanging of sharp knives as they transform simple vegetables, eggs, rice and meat into dinner with a show. Susumu isn’t the best food you’ll ever eat, although it is quite tasty – especially the shrimp appetizers. It’s definitely not healthy, as Susumu’s take on cooking meat seems to be that butter makes everything better. And given the flavor of the end product, I would argue that they are not wrong. Susumu is also not cheap, nor is it overly expensive. Dinner for 4, including 2 kids meals, a couple of adult beverages, splitting an entree of lobster and filet with a side of chicken, came out to around $100. That’s pretty expensive for Lynnwood, but not outrageous. In any case, despite its flaws we had a great experience at Susumu. What sets Susumu apart is the show. There really isn’t anything else like it in Lynnwood, or anywhere else in Snohomish county (though there are plenty of teppan-yaki places elsewhere in the world, to be sure). The chefs are fun and personable, and very skilled at what they do. But the best part was watching our kids faces as they marveled at what the chefs were doing on our grill. From the “egg roll” trick to the fiery onion volcano, they were transfixed the entire time. Considering that their favorite restaurants are Chuck E. Cheese and McDonalds, the fact that this technology- and Playplace-free zone was able to hold their interest through our entire meal is saying something. 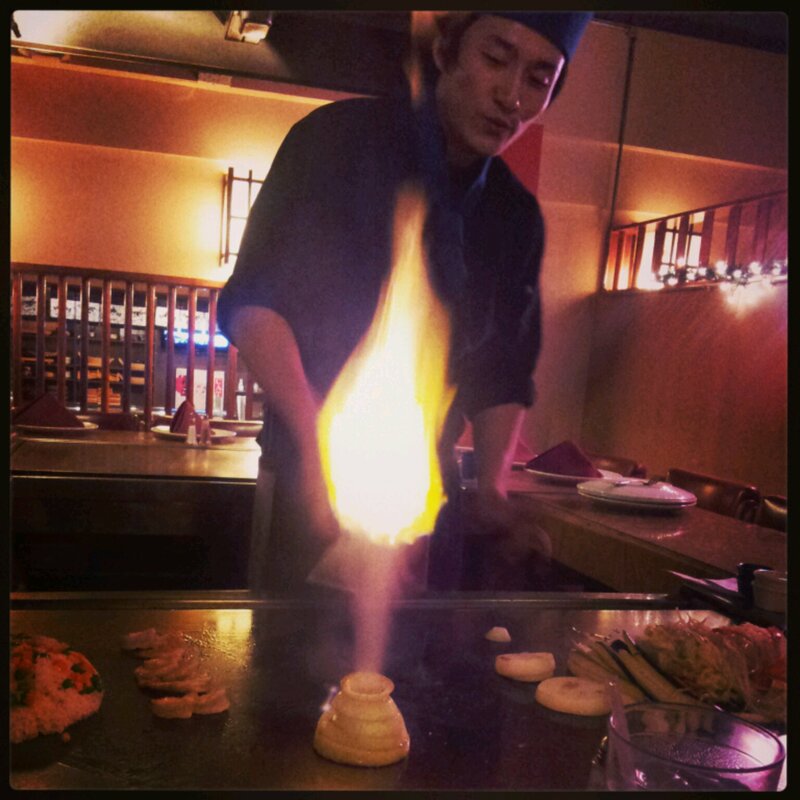 Susumu did what it does best – which is setting fire to your dinner in the most entertaining way possible. I love places like this! It’s been far too long since I’ve been to one. I bet your kids had a blast. Yes, they totally did. That fiery onion volcano is pretty hard to beat when you’re a 5 or 7 year old boy!